Lynn Shannon has been designing tasteful and distinctive residential, executive office, and commercial interiors since 1990. Lynn prides herself on helping clients to discover and express their unique style, working with them to create comfortable, eye-catching spaces that are fresh, yet timeless. She offers exceptional service, personal attention and seasoned expertise, as well as access to a pool of top-notch professional contractors. "To me, interior design is very personal," says Lynn. "I love creating retreats that people love to come home to." 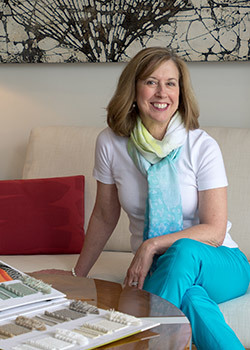 Her goal is to build a relationship with each client that produces a meaningful, mutually rewarding experience, including finding imaginative, cost-effective solutions to their specific interior design requirements. Lynn describes her interior design philosophy this way: "Design ideas become classic when they achieve comfort through simplicity, and beauty through compatibility with their surroundings." 2008 HGTV Segment - "New Spaces"